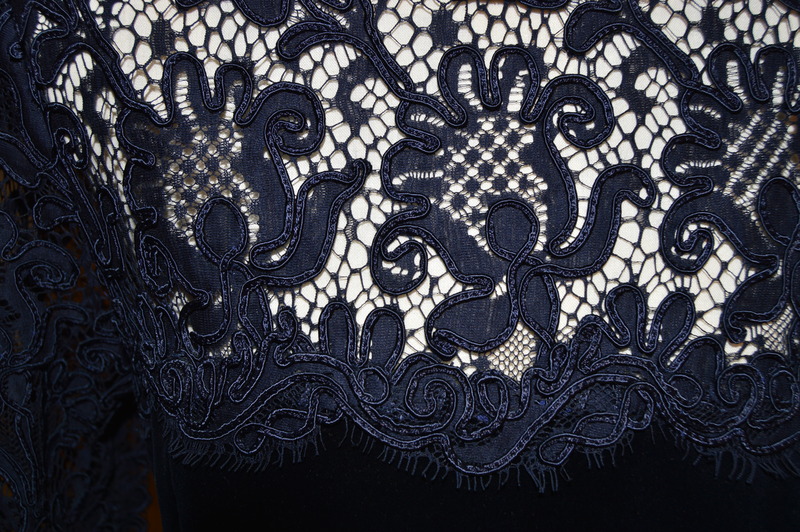 Gorgeous finishing details and use of lace. Love the bow at the neck and back shape. Thanks. I loved the challenges of this project. Exquisite. 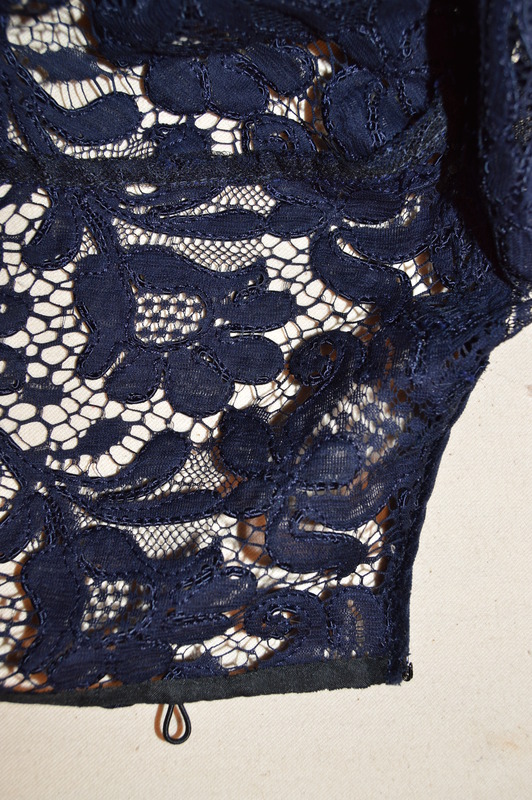 Such beautiful lace, and beautiful work. Thank you. This project required some creativity. Thank you Alethia. I follow your projects also and nice to hear from another RTW faster. Thank you. I watch for your beautiful things on the RTW Fasters page. Beautiful work, you must be absolutely thrilled with the results…….impeccable. This one had some complex details but I’m happy with the final result. Thank you. Such lovely work and a beautiful outcome! Thanks for showing us how you put it together. Thank you. Glad you enjoyed reading about the details. As usual, I love seeing all the details of your beautiful work! This is beautiful work, as ever. 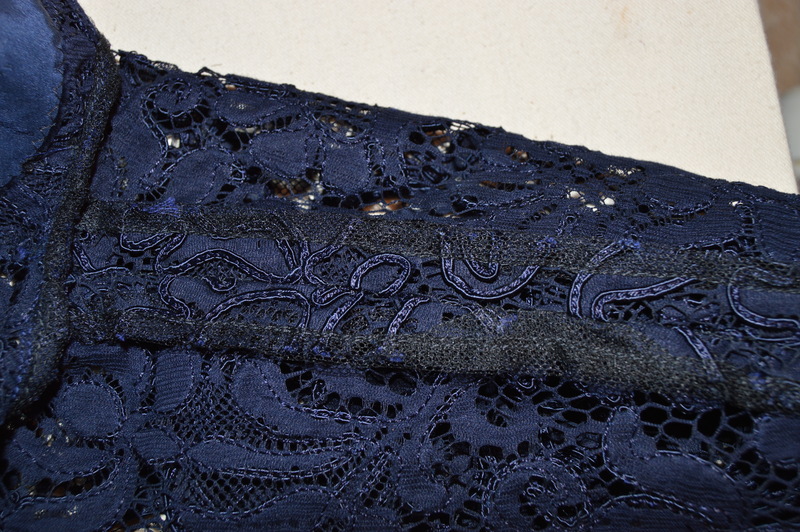 I love that this is navy rather than black – somehow it makes the lace really sing out. I am convinced now of the need for some silk tulle in my supplies. Mary – what is the difference between velvet and velveteen please? Velveteen is usually on a cotton base but I’ve seen it also in rayon. It tends to be a little more stable than velvet. Velvets are usually silk/ silk and rayon and are more fluid and drapey than velveteen. I do hope you will try some silk tulle. I find it an almost magic fabric and wonderful for many applications. It’s expensive but I save every scrap. 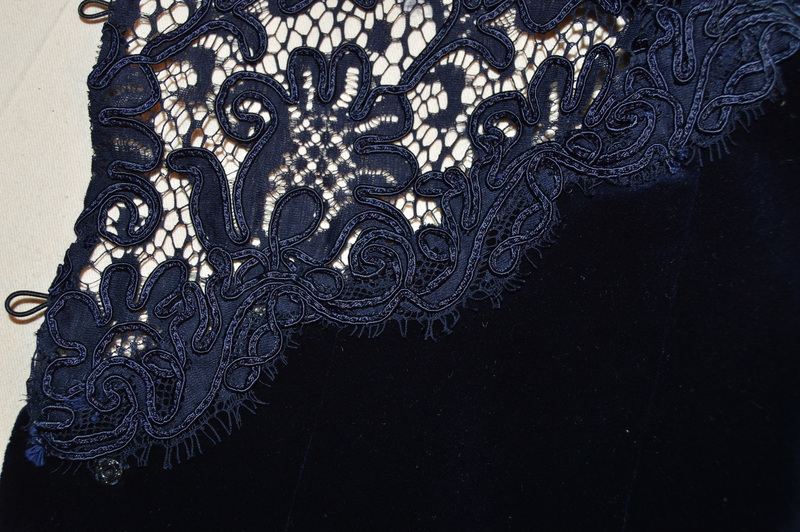 For all those thinking about using lace, this is a reference post that needs to be saved. Superb photos and descriptions for all of us!!!WOW! Thank you Mrs. Mole. I’m sure you have vast experience with all types of laces. Glad you felt this was useful. 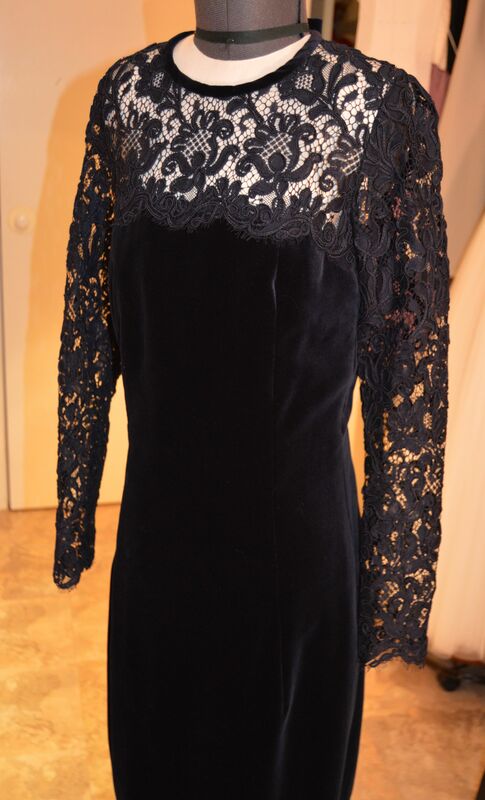 Lovely lace dress! 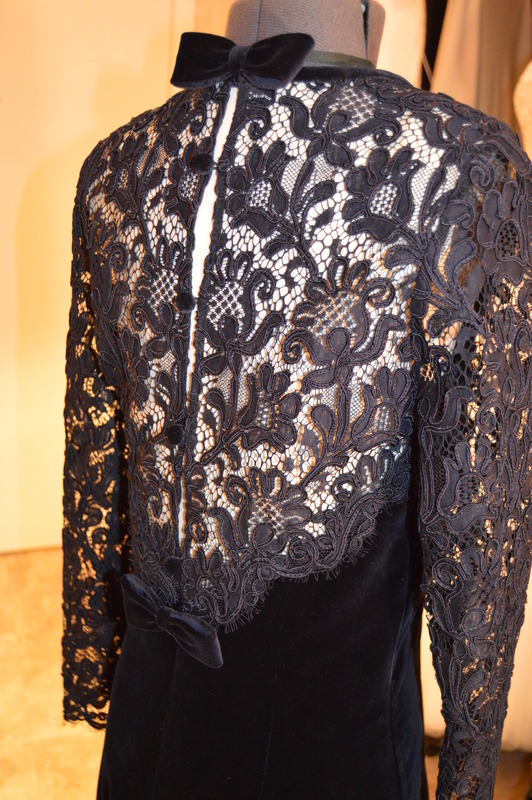 I love the design of the lace, too! How does the bodice fall when worn? I find some mixed material dresses tend to do a push/pull and leaves unsightly fit. No problems with this dress. The skirt is lined with silk crepe de chine and glides easily over the body. Lovely and great details. I’m just about to sew with lace for the first time. This is a great post to look at again and again. Glad you enjoyed and I hope you found helpful tips. Good luck with your first lace project. It is wonderful fabric to work with. Absolutely gorgeous! Love the navy (rather than black). Thanks for sharing all those details, what a great technique you used for the shoulders. And please, what is a tailor’s clapper? Thank you. A tailors clapper is a block of hard wood, usually white oak. You steam the seam and put the clapper down over the seam as soon as you remove the iron. That captures the steam and forces the fibers to lay flat. Leave the clapper in place until the seam is cold and you will have beautifully pressed flat seams (or other detail). Don’t use a soft wood such as pine as the sap will come out and damage your project. Tailors clappers are getting harder to find and some of the ones sold are quite small. Mine is about 3 x 12 inches and 2 inches thick. Thank you! I’m going to search for one, it sounds fascinating. And anything to make my beginner’s garments look better…. I’ve created quite a few lace things for my mother-in-law, who isn’t the smallest person in the world. My suggestions: use a soft lace such as chantilly or a softly draping guipure. She doesn’t need added volume. Fine tune the fit. A larger lady always looks better, and slimmer, if the fit is perfect. Choose a design which will skim over her larger parts. Feel free to contact me with design or fabric concerns and I’ll do my best to help. Good luck.